Running On Empty: Happy Easter! Today’s 6.2 mile run begins my final week of training (and taper week). I know, I said that I wouldn’t rack up any extra-curricular mileage….. But, I was running a decent pace today and wanted to go for a 10K PR (it’s only an extra .2 miles)! Well, my quest for a new 10K PR ended in success! 6.2 @ 50:51 (8:12 pace). Today’s run felt great and everything was in sync! 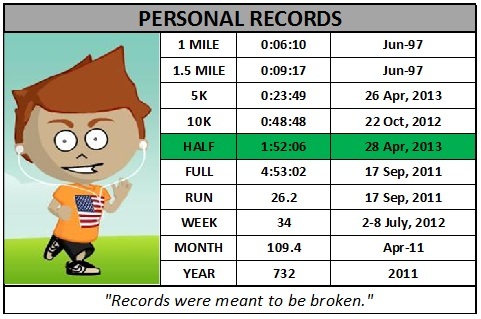 One more week and I’ll be down in Cincinnati going for another PR, hopefully a sub-2 hour half marathon! Take care!